A native Oregonian, Michael Brophy creates paintings that are uniquely indigenous to the Pacific Northwest. 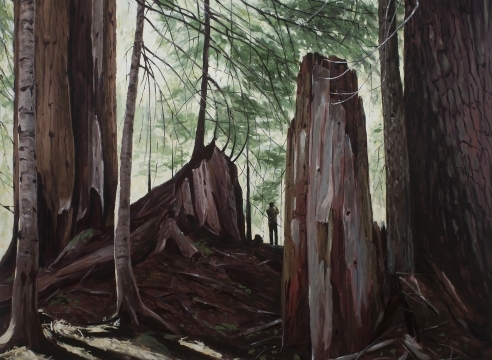 His work, ranging in scale from grand to more intimate in gouaches and oils, pays homage to Oregon’s natural and human history. He has chosen as his subject the Northwest Ethos: its history of exploration and settlement, and the relationship of its natives, settlers and contemporary residents to the natural and increasingly urban world. Brophy’s painting is dramatic in its grand scale, probing in content and precisely refined in technique. In this exhibition, he presents paintings that draw on historic and contemporary scenes, familiar to this region but with an ironic twist to their perspective. Michael Brophy graduated from the Pacific Northwest College of Art (PNCA) in 1985. He has taught art at Portland State University and PNCA. Recent exhibitions include Baja to Vancouver: The West Coast and Contemporary Art, Seattle Art Museum, traveling; The Grand View: Bierstadt to Brophy, Museum of Northwest Art, La Conner, WA; and Lewis and Clark Territory: Contemporary Artists on Race, Place, and Memory, Tacoma Art Museum. Other honors include a 2003 Fellowship for Individual Artist, Regional Arts& Culture Council, Portland; the 1997 Oregon Biennial at the Portland Art Museum were he received a Juror’s Award; a Pollock / Krasner Grant in 1995 and a Westaf NEA Grant in 1990. His work is in collections including Microsoft, Mentor Graphics, the Portland Art Museum, and the City of Portland, Oregon. He has completed commissions for Portland’s City Hall and the Columbia Gorge Discovery Center in Wasco, Oregon.